During the two-day testing with NASA and Boeing astronauts Nov. 1 and 2, the centrifuge spins with one of the astronauts inside. This new centrifuge is the Department of Defense’s only human-rated centrifuge with interchangeable cockpits, a capability that enabled NASA and AFRL engineers to create the astronauts’ cockpit. Submitted photo NASA spacesuit engineer Ian Meginnis is helped down from the centrifuge by KBRwyle contractor Brent Ochs with the Air Force Research Laboratory and NASA astronaut and physician Dr. Michael Barratt following his spin during centrifuge testing Nov. 1 and 2. WRIGHT-PATTERSON AIR FORCE BASE — It’s not often that Wright-Patterson Air Force Base hosts astronauts testing in its facilities. In fact, it’s been since the 1960s. But due in part to the relationship between the Air Force and NASA as well as the location and unique capabilities of the Defense Department’s only human-rated centrifuge, 10 astronauts in their royal blue flight suits walked through the doors of the Air Force Research Laboratory’s 711th Human Performance Wing at Wright-Patterson Air Force Base Nov. 1 to undergo two days of centrifuge testing. One of the 10 astronauts testing was Chris Ferguson, a former Navy fighter pilot, and former NASA astronaut who flew to space three times and was commander of shuttle Atlantis in 2011, the final shuttle to launch from the United States. Ferguson still wears the royal blue space suit but now, for Boeing as the first commercial astronaut. He explained that Boeing was testing in the centrifuge at the invitation of NASA. https://www.beavercreeknewscurrent.com/wp-content/uploads/sites/49/2018/11/web1_180802-F-HX758-1052.jpgDuring the two-day testing with NASA and Boeing astronauts Nov. 1 and 2, the centrifuge spins with one of the astronauts inside. 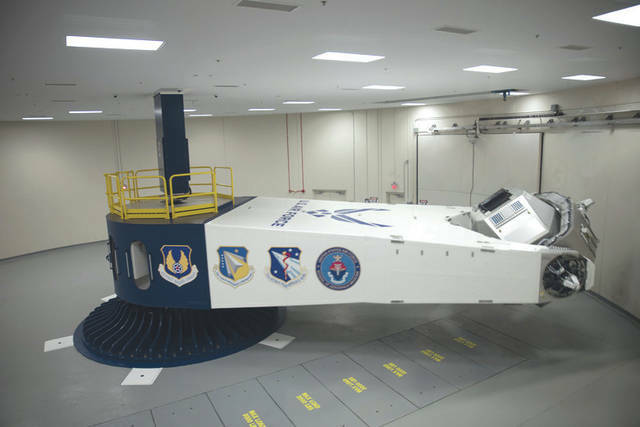 This new centrifuge is the Department of Defense’s only human-rated centrifuge with interchangeable cockpits, a capability that enabled NASA and AFRL engineers to create the astronauts’ cockpit. 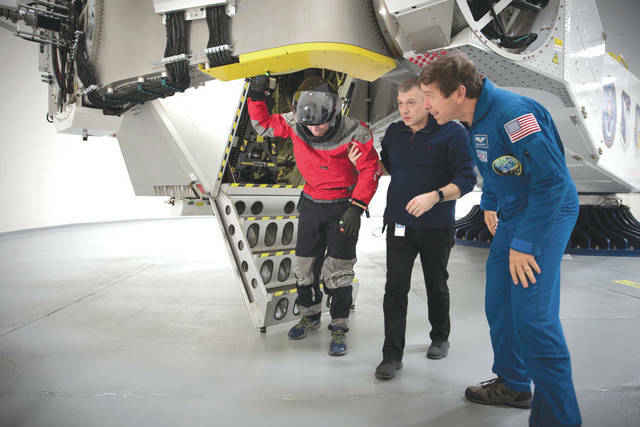 https://www.beavercreeknewscurrent.com/wp-content/uploads/sites/49/2018/11/web1_181101-F-HX758-1081.jpgSubmitted photo NASA spacesuit engineer Ian Meginnis is helped down from the centrifuge by KBRwyle contractor Brent Ochs with the Air Force Research Laboratory and NASA astronaut and physician Dr. Michael Barratt following his spin during centrifuge testing Nov. 1 and 2.